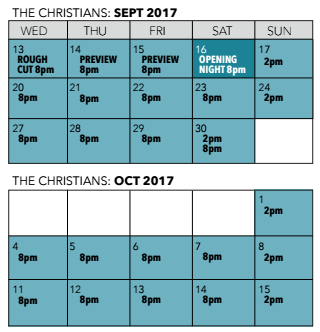 Actor’s Express' 30th Anniversary Season kicks off with the production of The Christians by Lucas Hnath. The show is a provocative and thoughtful examination of modern faith. The story follows a spiritually conflicted pastor and his divided congregation on their journey to find unity through faith and compassionate understanding. The production features a live choir on stage during performances, and we would like to invite members of the community to be a part of this story. We're looking to build a volunteer community choir composed of people from all faiths and backgrounds. The show itself does not focus on any particular denomination but on the many ways we understand the very nature of faith. We hope that you will join us and take this opportunity to collaborate with the greater Atlanta community and celebrate unity and that values that connect us. Volunteers will be asked to participate in at least one rehearsal. Volunteers who perform for at least three performances of The Christians will receive a pair of complimentary tickets to be used on any performance of the show. Rehearsals will take place weekly on Tuesday evenings. Performance dates are below. All volunteers are required to attend a mandatory choir rehearsal the Tuesday of the week they are performing. We hope to have approximately 25 choir members on stage at each performance. We've created an online forum for choir members to sign up individually based on their availability per performance. Actor's Express will share more information about ticket comps, dress code, and music at each Tuesday rehearsal. Please let us know if you have any questions. Thanks so much for your interest in participating in The Christians and we look forward to hearing from you!